Dr. Mark S. DeWaele graduated with distinction from Tufts School of Dental Medicine. While at Tufts, he won the prestigious prize in endodontics, graduated in the top 10% of his class in clinical dentistry and was named to the NE Aesepsis Committee. Prior to dental school, Dr. DeWaele graduated from Amherst College and Stern Business School. The focus of his practice for over 20 years is to provide families with the highest quality restorative, crown and bridge, implant and cosmetic dentistry. Dr. DeWaele is a Premier Provider for Invisalign orthodontic treatment. He is a past president of the New Canaan Dental Society and a member of both the American Dental Association and the Connecticut State Dental Society. Dr. DeWaele has been nominated by his peers as a Top Dental Professional in Connecticut for the past ten years. 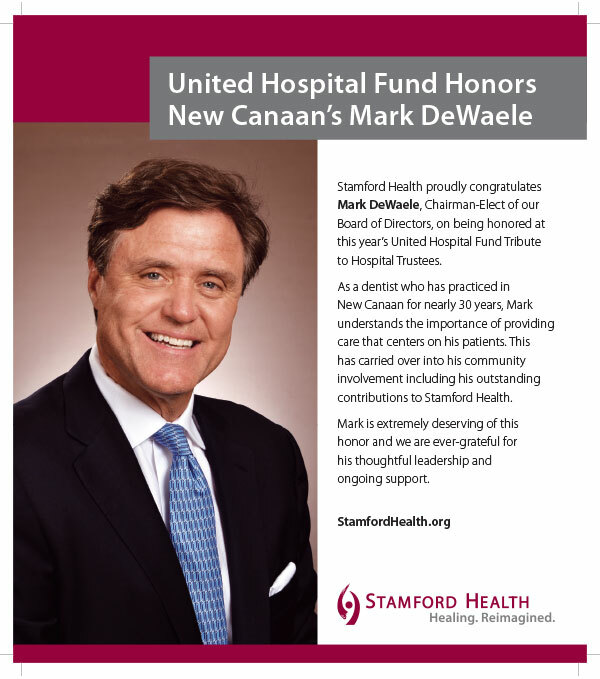 Dr. DeWaele is the Vice Chair and Chair Elect of the Stamford Hospital Board of Directors and a member of the Connecticut State Office of the Health Care Advocate. He is a past member of the Connecticut State Sustinet Health Commission. He was recently honored at the 2018 United Hospital Fund Tribute to Hospital Trustees.